in 5-a-side football at the World Trade Centre, Dubai. 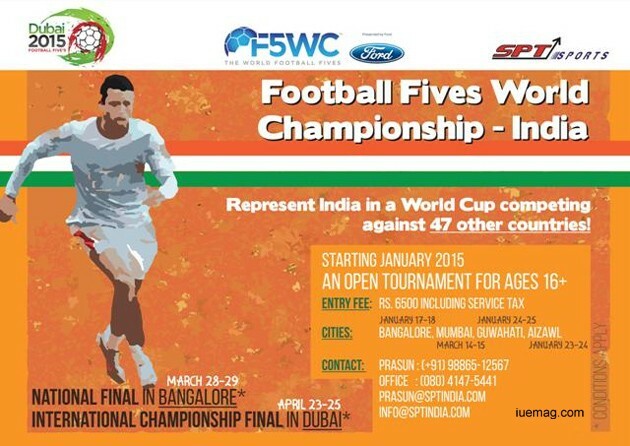 The Football Five’s World Championship is open to amateur players of 16 and above and teams of clubs, colleges, corporates or any group that can participate. This is an event for the football loving Indian masses yearning for a taste of an international footballer’s lifestyle. The National Winners will get to experience just that at the Global Finals in Dubai, where scouts from international football clubs will also be in attendance. off in Bangalore in mid-January and head to the North-Eastern states a week later. Footballers in Mizoram will have their chance to shine in Aizawl on January 23-24, followed by Guwahati in Assam on January 24-25. The carnival will roll into Mumbai in mid-March for the last city event. on 28-29 March, 2015, from where the national winners will be sent on an all expense paid trip to represent India at the World Championship finals in Dubai. Mullur Village, Near India International School, Bangalore – 560035.